cradled my dozy head quite nicely. The cool thing about them? I made them. Me, the non-sewer! Perhaps to those of you who sew, a simple square pillow can be done blindfolded, but I had to concentrate to make these. It wasn't hard, but getting to know a sewing machine is different than any other craft I've done. 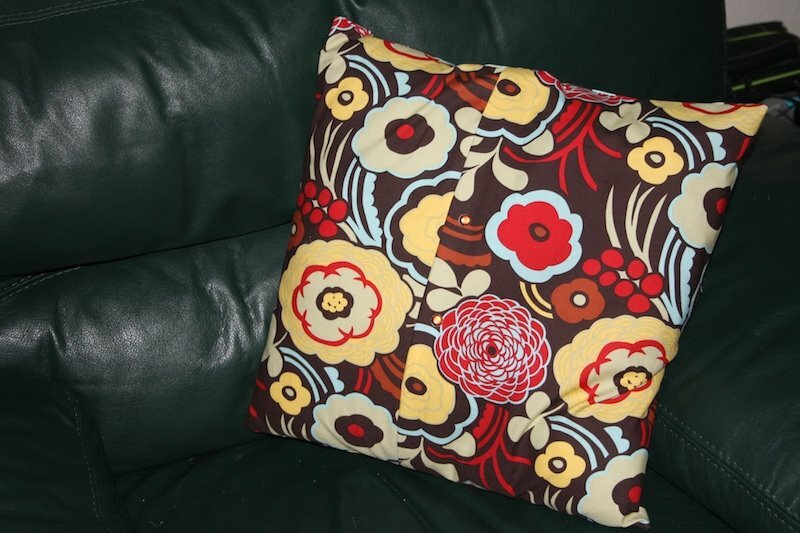 I learned how to make this basic pillowcase in the class I took Wednesday night. 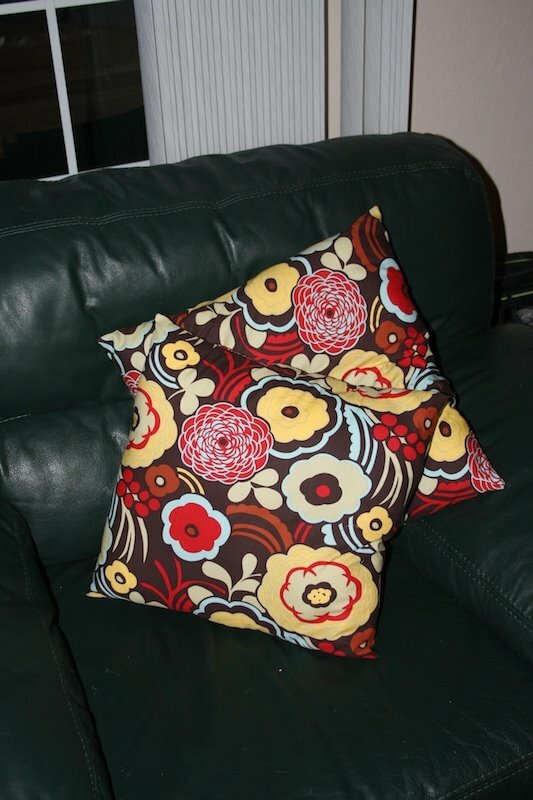 But the one I made in class was smaller and the material I used doesn't match my couch, so I made these today. It took me about 3 hours to do the 2 pillows. But my favorite part is the teeny tiny bit of extra that I added that we didn't learn in class. I added a couple of snaps to keep the pillow case closed in the back. They're the subtle shiny objects in the center of the pillow. I know how to attach snaps because of scrapbooking. It's not surprising that every craft is linked in some way or another. I'm not sure yet if sewing will grab me like other crafts have in the past. I'm not a very precise person when it comes to measuring and it seems like sewing requires quite a bit of precision. And so far my least favorite part of it is the ironing. Ironing. No sir, I don't like it. I'm fairly certain I won't get into sewing clothes. I'm planning on taking another class to learn a few more details. And I'm planning on taking a quilting class someday. This weekend I'm hoping to make a few potholders. If you sew, what do you like to create? Sewing can be fun...and simple because I am not talented. i have made curtains from sheets, ottoman covers from pillowcases and chair covers from them too. As long as it is nothing more than a straight, simple stitch, the needle or thread doesn't break i am fine. PS.....the pillows are cheery and obviously comfortable. Oh, Mad, these are awesome. I'm literally green with envy that you are sewing. And I am sure your talents will spill all over into this new venture. It shows already. Congratulations, these pillows are super! And I love the colours. I spent most of yesterday at YoungerSon's house making curtains for their Kitchen window from the cut off bits from some curtains that were too long for their french doors. Then they fed me a wonderful dinner in payment!! Keep up with the sewing, you will be amazed at your talents. Ok so i am still laughing, i thought i was the only human that didn't know her way around a sewing machine, and to boot my mother was a seamstress. Sewing was never one of my things to do and still isn't. I have sewn pillows however, but with a needle and thread. Hubby went to a yard sale once and brought home a sewing machine he paid 2 bucks for, took me forever to figure out how to thread and put in the bobbin, well i guess i should say he ended up doing it. You make me laugh, Mad! :D I have even done men's-wear clothing, including sports jackets and dress slacks (back in the 70s when polyester first came out). But I've never done the scrapbooking. We'd make a fine pair. But good for you. I love it that you have stretched yourself in so many ways! Look at you! 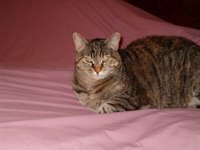 I loooove the fabric on the pillow. Totally my style too. I kinda/kinda can't sew. I fuddle through. Would love to learn how to make clothes, etc.